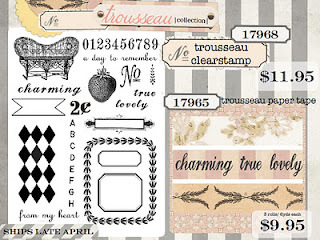 We have been patiently waiting for the lovely Trousseau Collection to arrive. 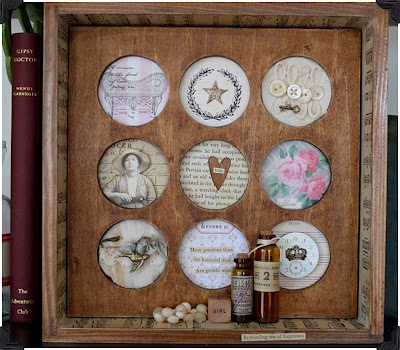 This amazing group of products was designed by our very own Kerry Lynn Yeary. 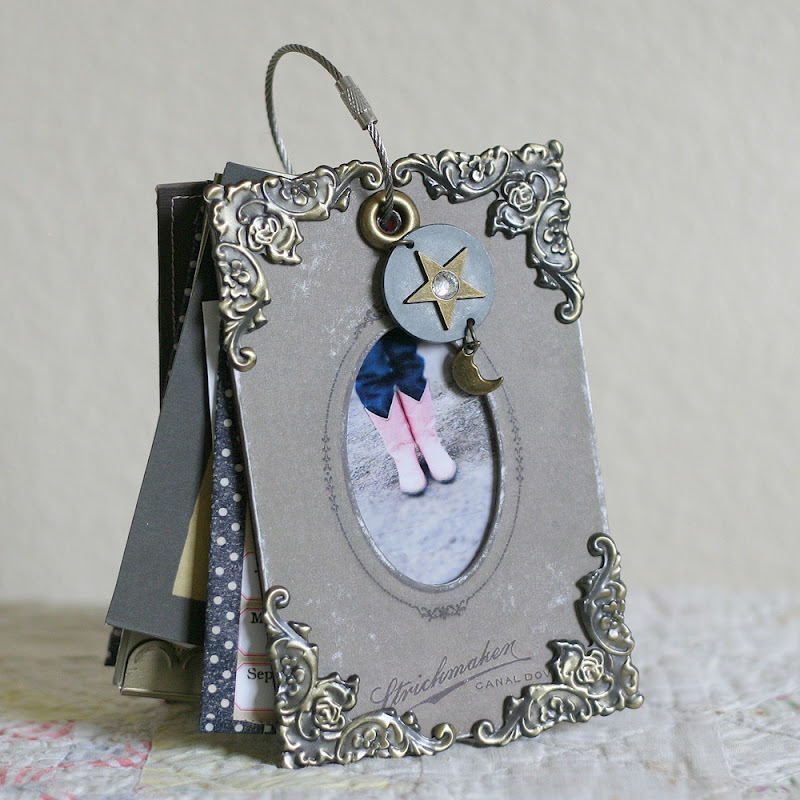 It features soft colors and textured surfaces mixed with patterns, photos, found book pages and fine laces. We have a little bundle of items we want to share! If you would like an opportunity to win this bundle of goodies, leave a comment by midnight Monday, the 25th. We will post the winner on Tuesday the 26th. What a wonderful bundle of goodies. This collection is so worth waiting for, it is lovely just like I would picture a trousseau to be. The colours and patterns are gorgeous, what a charming collection. It'd be lovely to create with it. So awesome! I love the soft colors! This would be perfect for a project I have in mind. Thanks for the fun giveaway! I would love to win this great bundle of goodies. Pick me, pick me (she says jumping up and down, and waving her hand high in the air)!!! WOW! This is a wonderful line of goods! Who wouldn't really really want to create with them!? They are beautiful. 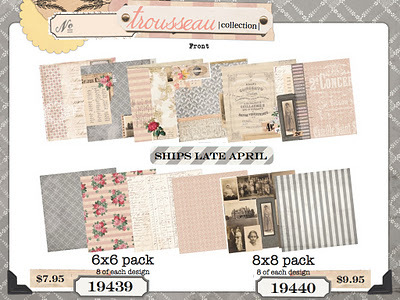 omg what a fab bundle of goodies ... you have no idea how hard i am crossing my fingers and toes right now! That is such a pretty new line of products. Such potential for amazing projects! I would LOVE to WIN this fabulous bundle of goodness! Wonderful collection!!!! I cross my fingers to win!!!! ;) Beautiful papers!!! Simply bodacious! Would love to win the treasure trove of items. Thank you! I love everything about this collection! Thanks for the chance to win. 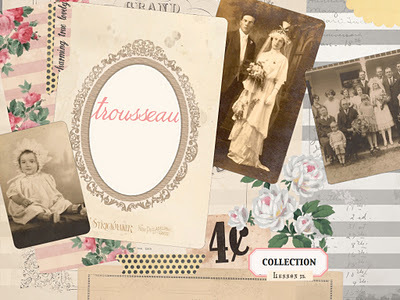 Wow, what a fab collection full of vintage goodness! Love all of it and would love the chance to own it. loving this collection... beautiful soft colours... will work with so many projects. Beautiful collection. Love the soft colors, laces and florals and the stamp set looks like it would be fun to create with. Your projects are beautiful and inspirational. Thanks for the chance to win. That. Collection. Is. Gor-geous! I would love to win it! Thanks for the chance; can't wait to see it in stores! Oh my!! Gorgeous new collection. Thank's for the chance to win! What a gorgeous collection. I always love everything 7 but this collection is stunning. This is gorgeous. Would love to win it. How do I love this? Let me count the ways! I will be sitting by my computer on Tuesday waiting for my name to pop up as the winner. What a beautiful new collection. Love the romantique feeling mixed with the vintage flavour. Thanks for the chance. Have a great weekend! Everytime I think.... oh my this one is my favorite, another lovely one comes along. Really love the color palette of this collection! Would love to get the chance to play with them... or I will have to go buy them! Thanks for sharing. Fantabulous!!! 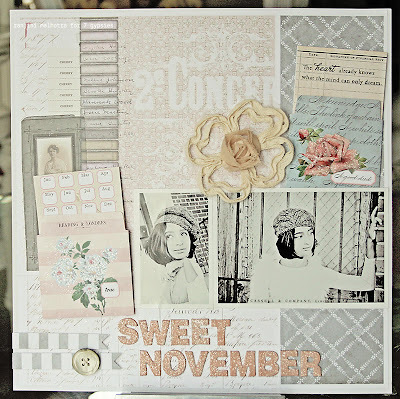 Love, love, love the vintage feel and the soft colors. So so lovely! Beautiful soft look! I wanna win...it's a beautiful collection! I can't wait to see it in person. This is one of the best lines ever. Wow what an awesome giveaway!!! This collection is fabulous. Can't wait to get some of it!! I Love your new line. 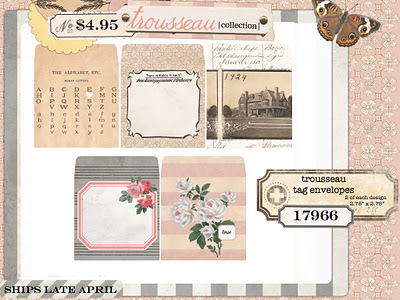 The projects that were made using theTrousseau are so creative!!! This is a lovely collection. Thanks for the chance to win. I love this collection. It is wonderful. Thanks, hope to win. Nancy P.
Looks like a fabulous new collection- would love to win it. tres chic..... oh so beautiful. Thank you for the chance to win this gorgeous package of goodies. I would love to win this gorgeous bundle!! WoW, LOVE this collection ... totally worth the wait! IMHO, this is a must-have! Can't wait to add this collection to my stash!! oh my gosh I was drooling over this from an online store...I LOVE it!! hope I win! This Trousseau Collection is so lovely and dreamy... BEAUTIFUL! It brings delightful memories of my childhood days when my grandmother would open her "trunk of treasures" to tell me stories of her life. Oh, so sweet, lovey and yummy. Pick me, pretty please. Yay! this paper line is so beautiful! I would love to get my hands on this!! my goodness, what an elegant bundle of beauty this is, oh please pick me! luscious collection. thank you for sharing. I have been anxiously waiting for this collection - worse than for my wedding day. It's gorgeous can't wait to create with it. What a fabulous collection... I would love to win! The possibilities with this line! Can't wait to use this! Thanks for the chance to win! 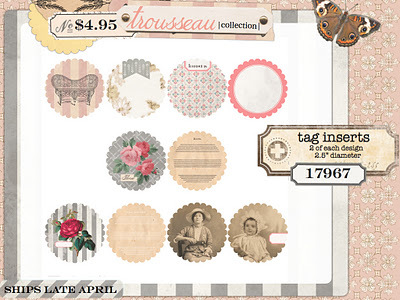 I love the soft muted colors of this collection. Thank you for the opportunity to win. Just gorgeous!! I would love to win this set. Thank you for the chance! A wonderful collection with a wonderful evocative label. Oh! Another great giveaway! All that inspiration AND a chance to win. You're the BEST! Thanks! Definitely worth the wait. So lovely. Good luck everyone! I have been waiting for this collection --so beautiful! Amazing collection! love the tones and patterns. I would love to give this a home! Thanks so much for the chance to win. What a wonderful collection! This is all so gorgeous. What to do first?! Do I make an amazing layout? Mini album? Alter up a goodie? My creative juices are flowing just thinking about it! Beautiful collection with so many possibilities! Absolutely love this Trousseau collection - so soft and welcoming. Great job Terry Lynn. I don't think I have ever met a product of yours I didn't want. Thanks for the chance to win this beautiful collection. I love the soft colors and those gorgeous roses. So pretty! Thanks for the opportunity! What a gorgeous collection!! I love everything about it! !THX for a chance to win! gorgeous goodies, would love to be able to play with them. cute projects too. thanks for the chance to win. 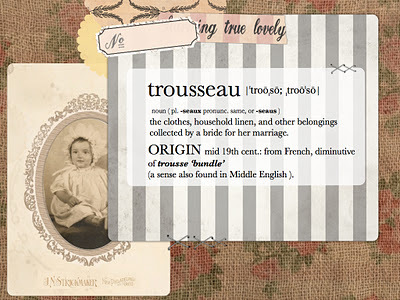 It's exactly what I imagined a vintage trousseau to be. You hit right on the head with this one! Oh, I love this new collection! So beautiful! Can´t wait to see it in person! such a beautiful collection. Can't wait to find it, if I don't win it of course. Thanks for the chance. I would love to win this prize package. I love this collection. Another lovely group! can't wait and thank you for a chance to win! This is an amazing collection! I would love to win this! Who wouldn't love to win that ?!! Beee-you-ti-ful !! This is such a lovely collection! It would be very happy at my house! Such a beautiful collection! Who wouldn't want to win it?! Been waiting for this collection to do a heritage album. Can't wait to get started, maybe it'll be cheaper than I thought! Pick me, Pick me! Love this collection!! 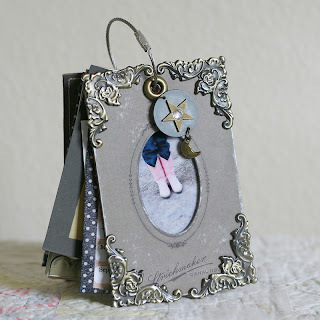 There are so many cards and pages that could be made, it would be so awesome to have it!! Would love to win this!! Thanks!! Lovely collection, the color palette is exquisite. I can't wait to get my hands on the whole collection. Thanks for the chance to win. it's my lucky day! I just stumbled upon your blog after clicking on a link on Pinterest. What lovely goodies! I am bookmarking your website. Thanks for the chance to win! What a wonderful grouping! I love the colors. I would love to win this. I am thinking a smash book! thanks for the opportunity. Beautiful collection - love the colors. OOOOO! I was looking at this collection online this weekend. It would be wonderful to win this amazing package. Oh I am totally in love. This collection is stunning. I just don't know how you continue to find new things to inspire and aww us. This reminds me of my grandmothers back bedroom in the home my mother grew up in. The wall paper was gray with pink roses. Beautiful. So very pretty! I love it all! So gorgeous! Love this romantic bundle of goodness! Cheers! Gorgeous! The soft colors and patterns are beautiful and I love the vintage feel. Thanks for the giveaway! How does one even go about designing such a gorgeous line? It really is beautiful and so very vintage in the way vintage should be! Thanks for sharing!! How awesome is the package of goodies! An absolute delight. Thanks for the opportunity to win this precious collection. I am drooling! What a gorgeous collection!! Thank you so much for the chance to win! !